I checked my internet speed test here Edit by papercoffee. The exact same text and the exact same net speed ... And you where warned to use this speed test side. But you still link to it. We don't like spammer here bye bye. here is mine speedtest on old house soon ill hope mine internet will be faster. same internet provider but then glassfiber. 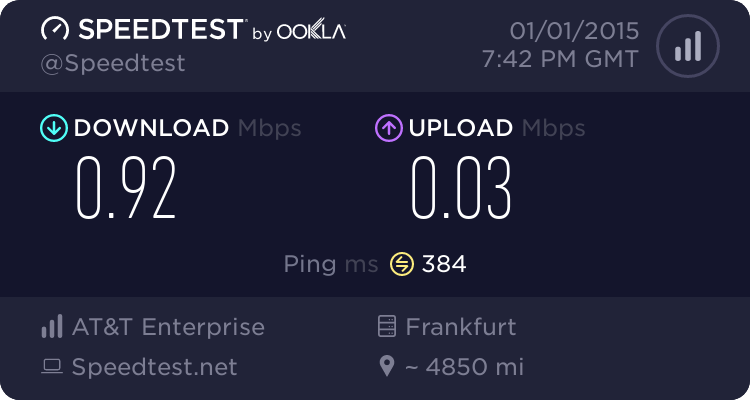 Something is absolutely wrong with my provider ...especially because I'm a customer of Netcologne.de and not AT&T. 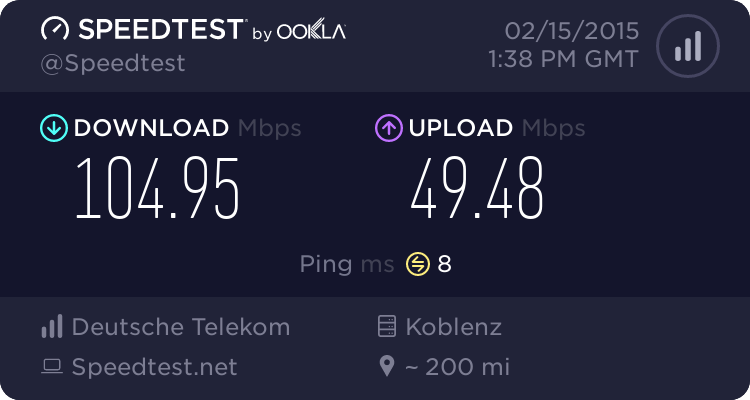 Bist du sicher dass du nicht über einen Hotspot im Netz bist? noccer wrote: Bist du sicher dass du nicht über einen Hotspot im Netz bist? I don't have a hot-spot in my neighbourhood. The problems started 3 o'clock on new year. Are you using a VPN or a proxy by any chance? Is your internet speed actually slow or is speedtest messing things up? Do you happen to know anyone with the same provider that you could ask if they have the same problem? Things that come to mind (assuming that speedtest is correct) are that your ISP messed up something badly, something went wrong with your proxy/VPN, someone messed with your computer, you have malware on your pc. I have a neighbour/friend with the same provider in my area, he has the same problems. The internet got better right now but still weaker then a month ago. I think something went wrong on the provider side, but the first of January is a holiday here and I think someone without the needed skills (janitor) fixed it. Ah ...I forgot ...no I don't use a VPN or a proxy. I see, I would advice that you scan for malware if you have not done so already as that would narrow things even further. Just saw this thread. My results are exactly as should be - DL 20.8 Mbps, UL 1.1 Mbps, ping 18 ms . No need to attach screenshot, I guess. Useful tool, but ... 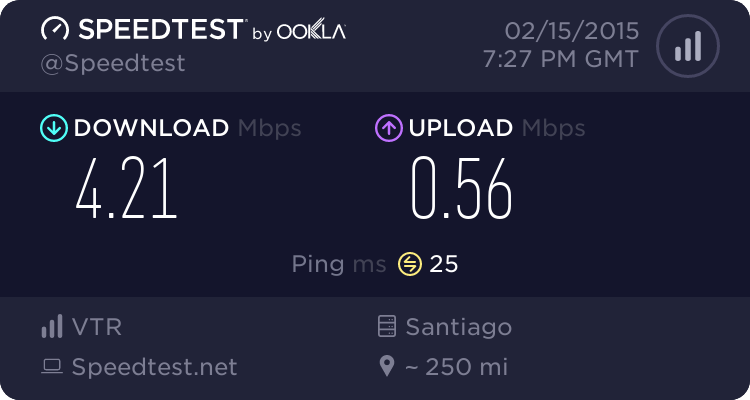 I think that this way of measuring is not good for every crap connection - and I consider mine as crap for UT playing online. Yes, I can DL with 2.5 MB/sec, what is claimed and paid speed. I don't know what data rate is needed for good UT99 play, but it must be at least 100 less than my bandwith. Or lets say some 200 Kbps. 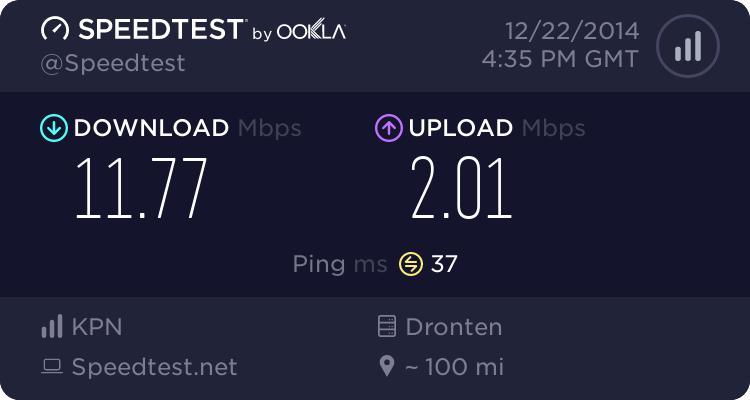 But even if it is 2 Mbps, it is still far from bandwith. My problem is that when there are many players on map, and that many means 6 for instance, I simply can not make frags. It is like having blank bullets. You hit someone, but nothing happens. Additionally, lag varies all time - on better servers (for me) ping about 50-60 is shown, but it jumps often over 150, 200 . Actually, most accurate ping value is shown when start to list favorites. First list always gives much bigger pings than next ones, or in-match displaying. So, my theory is that my provider uses slow multiplexing. To explain: multiplexing is something like switching between apps, tasks in Windows. Once CPU (lets forget multi core this time) performs all tasks, and you have feeling that all it works simultaneously. Switching must go with some higher freq. otherwise you would be not able to watch some video while other prg. works in background. Similar is with multiplexing several Internet users on single optical cable, which has much bigger bandwith than single users. If you do it with high freq. it will be fine for online gaming, because delay will be invisible low. But, if switching freq. by multiplexing is low, lets say 10x in sec, then you may have delay of 100mS while waiting that your line's turn comes. It harms not surfing and DL, or even streaming, where buffering is used. Is it possible to measure somehow continuity of Internet connection, inside 1/10 sec. for instance ?